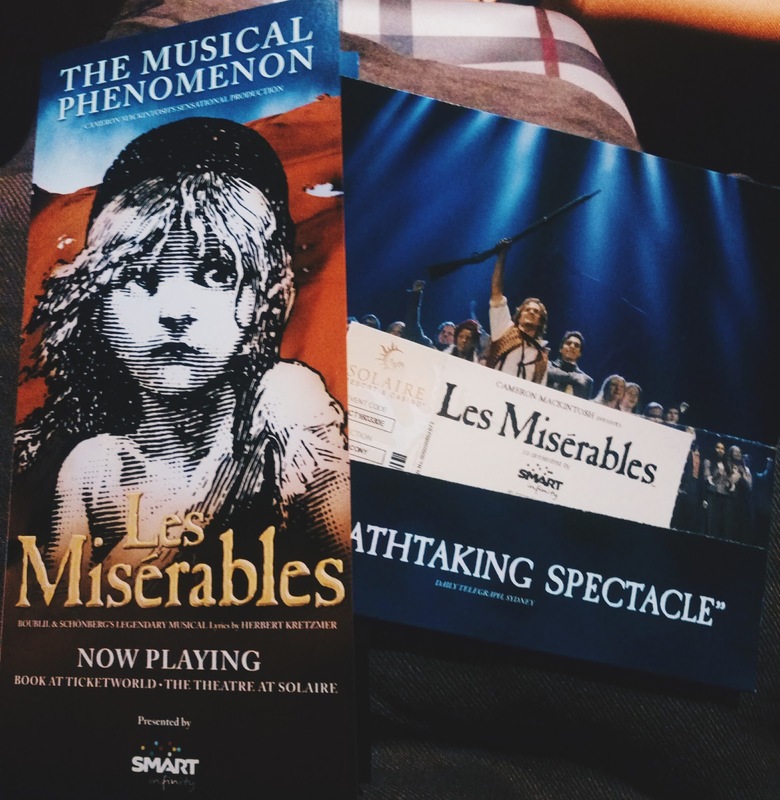 Watching Les Miserables in Solaire Theatre was an experience of many firsts. First time to watch a show with an international cast. I've seen a number of plays since the very first one (which was Trumpets' The Lion, the Witch, and the Wardrobe) but they were all usually with a local cast. First time to watch a play as popular as Les Miserables (did you know when I was a kid I thought there would be a lot of dialogue in between the songs?). 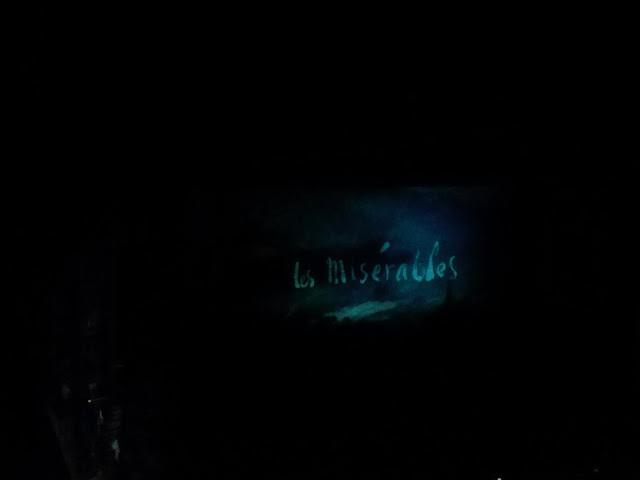 First time to watch Les Miserables live. First time to watch a play where an orchestra plays live. First time to go Solaire. First time to dress up for a gala show. First time to watch a play with two of the best girls I have ever met. The list goes on and on. Sans casinos and the cloying (yes, literatures days! That means "sickeningly sweet") scent that pervades almost every nook and cranny, Solaire is a pretty grand place from the gold lights to the floors of marble and carpet. The theater is not as big as CCP, but, in my opinion, just the right, intimate size. I heard that there was a sentiment going on that it should have been staged at CCP, but I'm glad it wasn't. I love that the show started on the dot. As soon as the voice announcing that we were to turn off our cellphones ceased speaking, all the house lights turned off, the stage lights—at least, some of them—turned on. And then you hear it, the opening strains of Les Miserables that is so familiar to us who have grown up hearing the music. Men—prisoners—chained to oars as they row a boat under the watchful eye of Inspector Javert. Cue in the chills and the fangirling. It was all I could do not to burst out into song with the actors. I had to content myself with mouthing the lyrics instead. The set was so...wow. I am speechless. The transitions were smooth and seamless (sans a couple of scenes perhaps). I love how they built the set, using only parts of the stage to tell the story, but you understand it right away because, it feeds your mind the illusion that goes with the story. Pull out a panel, and you have an interior wall of the priest's house. Pull in stone wall with a gate, and Cosette in the garden comes into view, pining for this boy she caught a glimpse of on the street. Jean Valjean's soliloquy "Who Am I?" has him facing the audience and walking around the stage as he agonises, to tell or not to tell his past? And just as he sings his line "I'm Jean Valjean!" he whirls to face the back of the stage and the scene changes--the back opens so quickly to reveal a court and the prisoner who is being tried and convicted as Jean Valjean. I cannot do it justice as I tell it. You will have to see it for yourself. And the effects! Another wow, wow, wow! The part where Jean Valjean is dragging through the tunnels? What was that? Was there a TV in there? And what makes their voices echo? And when Javert sings his reprise of "Stars" before plunging into the river in despair? Oh, wow. I was waiting for that moment. It's easy to create that scene in movies where you have green screens and CGI and all those special effects, but I was excited to see how they would interpret it in a stage play. I did not expect or think that they would interpret it the way they did--no falling down a trapdoor forward or backward. No lights suddenly shutting off together to imply that the character has plunged himself to his watery grave. Instead, the rails rise, and we are given the illusion that he is falling, faster, faster, and then the stage lights reflect water and we know that Javert has drowned himself. Again, words do not give it justice. We didn't get to see Rachel Ann Go, which made me kind of disappointed, as everyone has been raving about her. Ah well, next time. Some things are just not meant to be, like Marius and Eponine. Speaking of the latter, Eponine was played by Kerrie Anne Greenland, and she has such a lovely voice. As we were seated at the topmost part of the theatre, the faces were no more than a blur, and yet we could hear the pain in her voice as she sang, "Without him, the world will go on turning. The world is full of happiness that I have never known!" And again, the resignation, when she sang, "I love him, but only on my own." Simon Gleeson was awesome as Jean Valjean. And Enjolras! Chris Durling played him, and while I think Ramin Karimloo my love will always be my favourite, I love the strength, passion, the resolution in the Chris' voice as he sang "Red and Black" and "Do You Hear the People Sing?" The play is not all passionate highs and rallying people together to fight for a common cause. After the barricade has fallen, signifying the end of the June Rebellion—and not the French Revolution, as people usually think it to be—Marius is left, the only survivor, thanks to Jean Valjean's kindness. And yet, he is haunted by the fact that he is indeed alive, while everyone else, including Gavroche and Eponine, has died. Les Miserables Manila does a beautiful interpretation of the song, "Empty Chairs and Empty Tables", where the "ghosts" pick up the candles and the sudden darkness leaves Marius very much alone. Les Miserables goes beyond the theatrics and the amazing lights, stage effects, set, cast. A play couldn't be that powerful and leave everyone much affected, if it weren't for the very story written by Victor Hugo. It's his characters that people relate to, in which people see as a reflection of themselves—the Jean Valjeans, standing at the brink of a dark past and a hopeful future; the Enjolrases and the rest of the students, idealists and dreamers who wish to fix the broken world; the Javerts, the realists, those who live by the book; the Eponines, those who love without that same love being returned to them (I once saw a meme that said that the highest level of friendzone level is the Eponine Level). And again, the list goes on and on. I am a huge fan of Victor Hugo's works, though some of them may be too depressing for others. He does not waste characters. Not in The Hunchback of Notre Dame, certainly not in Les Miserables. Take for instance Gavroche. It's been some years since the Jean Valjean came to the Thernardier's inn to take Cosette away. Neither the movie nor the play mention this, but there was a boy in a crib that night that Mrs. Thernardier often forgot, so engrossed was she in her two daughters and in running the inn. It is only when they are grown up that we learn that one of those two girls was Eponine. And the boy in the crib was Gavroche. Which is why, in the "A Little Fall of Rain", my heart always breaks for Gavroche. Eponine was the one who would check up on him every now and then, long after the Thernardiers forgot that they had children to look after. Enter Grantaire as well. Most people will know him as the the boy who was always drunk every time a scene with the students happens. But Grantaire had a tender heart, and it was he who looked after Gavroche. In Les Miserables Manila, after Eponine is shot, and she lies dying in Marius' arms, Gavroche runs to her, but Grantaire stops him and comforts the little lad for the death of the only relative who ever cared for him. When Gavroche dies, it is Grantaire who holds him when he takes his last breath, and it is Gavroche's death that makes the indecisive Grantaire make up his mind to stand with Enjolras and the rest of the people in the barricade. It is Grantaire who dies beside Enjolras, the last two students standing for the rights of the people.